Someone really needs to get this guy on their farm for breeding! He is ready to go! We would use him but he is too closely related to others on our farm. We are proud and honored to offer Genesis Adam as a proven herd sire. Genesis Adam is a product out of the breeding of the iMpressive dam, Desiree (who herself has produced many champions) and the established Young Felipe line (Rockstar and Torbio heritage). He has the perfect suri type wedged head and proportion. NGG Catarina is an incredibly dense and lustrous half Accoyo full Peruvian female. 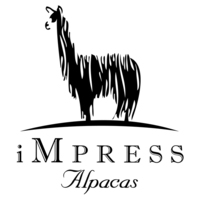 Her dam is 4 Peruvian Cassana, a light fawn female who had a micron count of 18 when imported as a yearling. Her sire is NGG Accoyo Don Cochise by DonQ. NGG Catarina was shown twice in 2004 as a juvenile, at MAPACA (Champion Beige Suri Female) and at AOBA (6th). Catarina has a history of producing champs year after year. 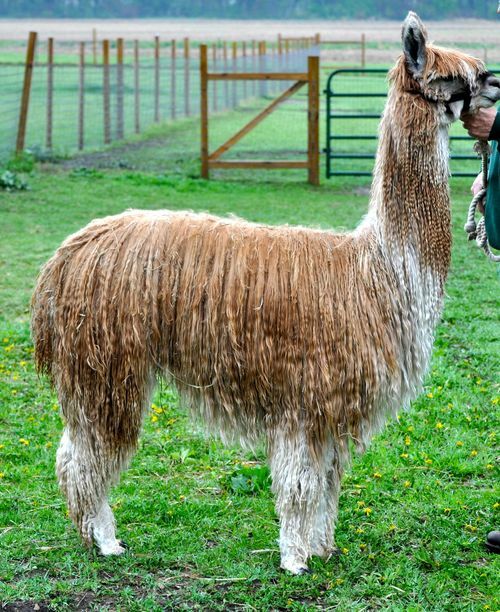 IAF Cadamia is a cria born out of our Catarina and IAF Genesis Adam. 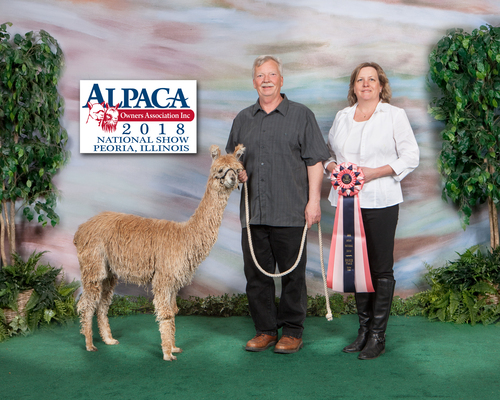 She has put Adam on the map and continues Catarina's successful legacy of producing cria that make a mark in the ring! Her half brother has now entered our breeding program. 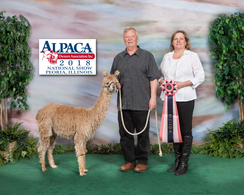 Cadamia's first showing was at the 2018 AOA National Show in Peoria, IL. She did very well at 7 months with a 4th in the halter show and 5th in the walking fleece. Her fleece is over the top in color, lock structure and fineness. The best way to visualize her color is to think of a macadamia nut, hence we named her Cadamia. Her lock structure is well-defined and super soft. Her penciling is outstanding like her dad's neck. She is taking after her sire with a MSL to brag about. A recent fleece sample was over 6" long for a 8 month old!!!! Amazing!!!! Caddy, as we call her, would diversify your breeding program with Rockstar genetics (via Young Felipe) and a proven champion dam in her heritage.